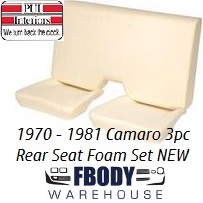 New replacement 3 pc REAR seat foams for use on 1970 -1981 Camaro. 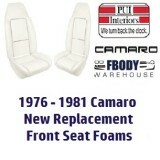 New replacement front seat foams for use on 1970 - 1981 Camaro Seat foams work on both cars with standard and also deluxe interior. Sold Ias a complete rear seat 3 piece set! Produced by PUI these new replacement seat foams compliment the new replacement seat covers we also offer our clients! After 40 years seat foams tend to wear out, break down, and crumble. Why back pad and try to make worn seat buns and foams work? Replacement seat foams are simple to install and make your front seats fluff and look full like a showroom car! Watch our full video installation series located in the Video Library! NOTE: Units can ship to the USA and Canada only. If Canadian please select the Canadian shipping upcharge below. Units ship direct from the producer and transit times can be from 7 days to 4 weeks. Need it fast? 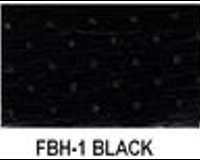 Call us prior to ordering to check stock!